Jacob Zuma married his third wife earlier this month in a traditional Zulu ceremony. 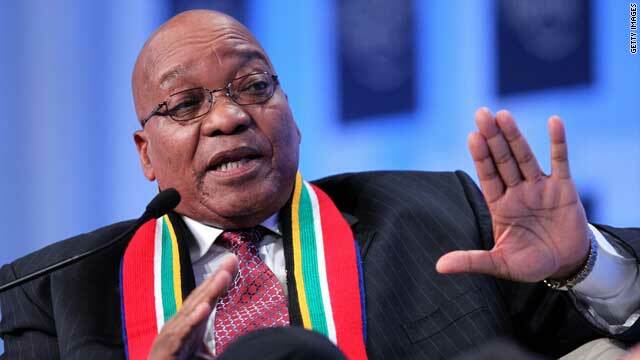 Davos, Switzerland (CNN) -- South African President Jacob Zuma was forced to defend his right to have three wives Thursday, after he was put on the spot during an interview at the World Economic Forum in Davos. Polygamy is legal in South Africa but remains a subject of contentious national debate. Zuma has married five times in total but has faced criticism from opponents who say the practice is out of step with modern times and inherently unfair to women. On the second day of the WEF, Zuma told Newsweek editor Fareed Zakaria it is part of his culture. "People interpret cultures differently," he said. "Some people think their culture is superior to others, that it is the only one accepted by God. "That is a problem and one we need to deal with. We (South Africa) follow a policy that says we must respect the cultures of others." He married third wife Tobeka Madiba earlier this month in a traditional Zulu ceremony at his rural homestead in the Zululand area of KwaZulu-Natal, South Africa. Zuma's first wife, Sizakele Khumalo, was among those in attendance to see her husband, 68 this year, marry 37-year-old Madiba. He married his current second wife Nompumelelo Ntuli two years ago. In 1998 he divorced home affairs minister Nkosazana Dlamini, while another wife, Kate Mantsho, committed suicide in 2000. Reverend Theunis Botha, the leader of the opposition Christian Democratic Party, called the latest ceremony a "giant step bak into the dark ages." But Zuma told Zakaria that his cultural choices do not influence his political beliefs or his views on female equality. Asked if he treated his three wives equally, he replied: "absolutely," much to the amusement of the packed conference hall. Meanwhile, Zuma appeared to distance himself from the policies of his predecessor Thabo Mbeki on the issue of HIV/AIDS. South Africa has the highest rate of infection in the world, according to the U.N.
Much to the consternation of health experts around the world, Mbeki insisted its root cause was poverty, poor nourishment and general ill-health. The solution he claimed was not expensive western medicine, but the alleviation of poverty in Africa. "I know that people have tended to look at our policies based on what some of our colleagues said as individuals," explained Zuma. But he quickly added the views of Mbeki got scientists to answer questions about HIV/AID that needed to be answered. "It provoked a debate," he said. He said his government has now adapted its policy on the issue in an effort to "remove the perception" about the root causes that existed previously. "I think the world is very happy with the approach we have now."